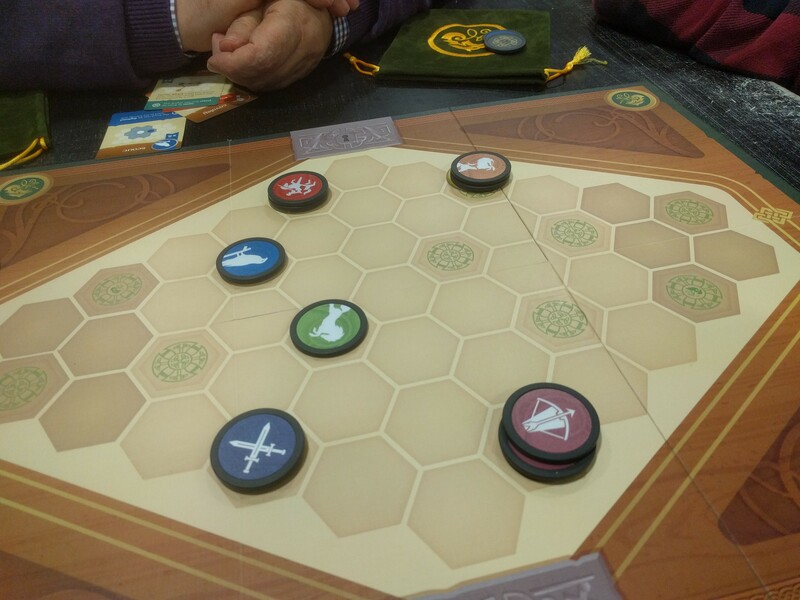 The first game we tried was War Chest, something I've seen mentioned a lot recently. The basic idea is interesting: it's a bag-builder, where you can use tokens either as deployed units, as activation markers to do things to units already on the board, or to buy in more tokens. But somehow it didn't spark. It's rather chess-like in that you need to keep an eye on where the enemy can move and attack, but at the same time you're at the mercy of the bag draw to be able to do anything about it. There's about as much planning as in Onitama (about three moves ahead at most), but the number of options you have to choose from is much more restricted, and the same silliness one finds in something like Up Front (where a unit obviously ought to be the next one to move or attack, but can't because the right card hasn't come up) turns up here too. (Which is fine in a proper wargame – it's the core of something like Chain of Command which is trying to represent real scared soldiers – but in something as abstracted as this, where the only difference between pikemen and cavalry is a special power on the card, just seems frustrating.) 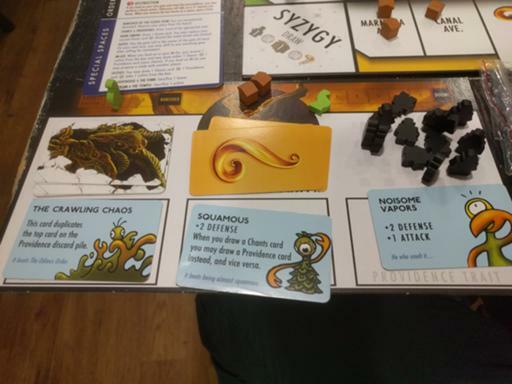 As the game progresses and units are eliminated, everything bogs down and more of the tokens become useless, which doesn't help matters. Not for me. 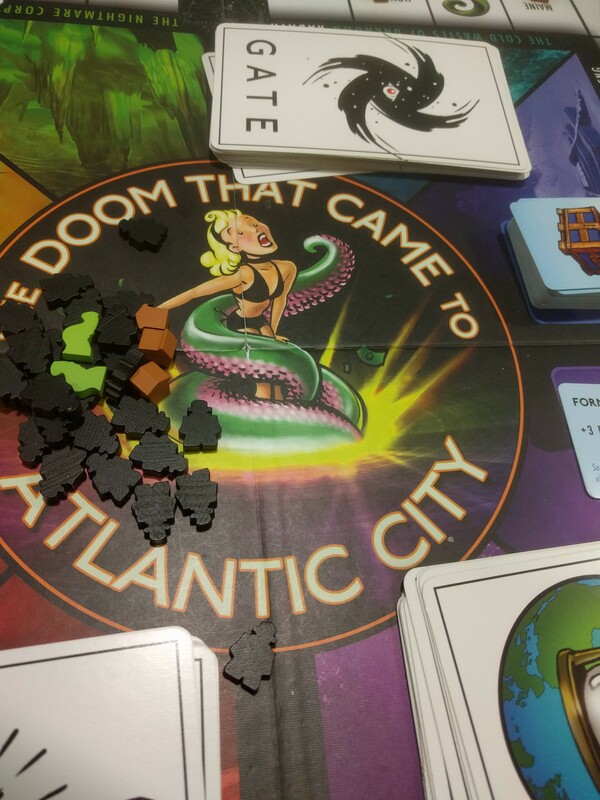 Next was the famously failed Kickstarter project The Doom That Came To Atlantic City: the houses are on the board already, and you're a Lovecraftian deity smashing human society and opening gates. 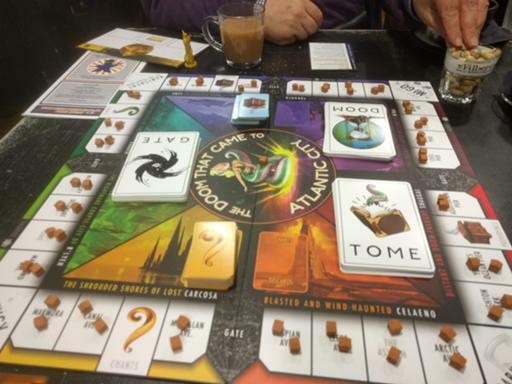 The basic problem for me was that, in order to be recognisably a Monopoly derivative, it's still a roll-and-move game, which means that far too much of one's play is controlled by chance. You may end up on a gate, and thus be allowed to jump to a different gate after you've rolled the dice for your next move; you may pick up a power that gives you an optional +1 to your movement; or you may not, in which case you may as I did play several turns in a row with no decisions to make. Keith Baker designed this, and I find that generally I'm not a fan of his game mechanics (I do like Illimat a great deal, but that's apparently a reimplementation of a classic card game). Gloom… is OK, but I don't have a copy any more. And that logo just makes me think of Tintin in a bikini. 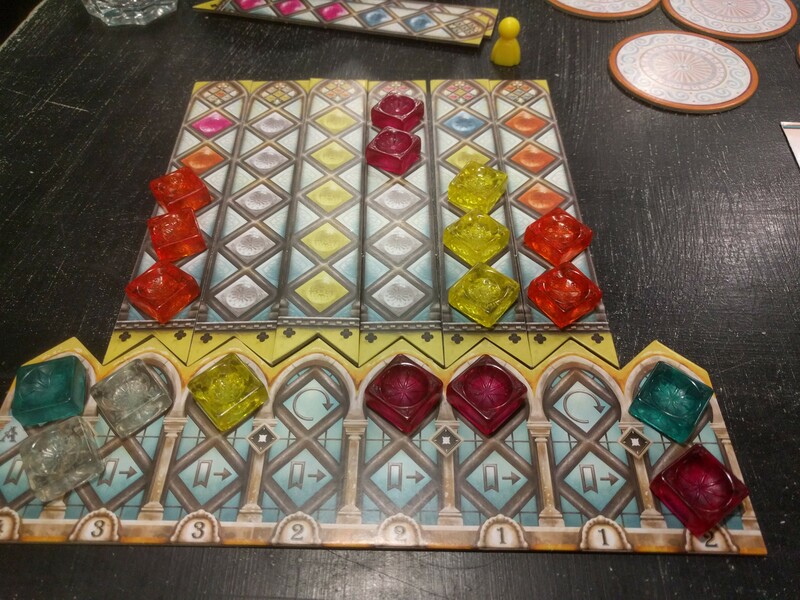 Finally, new hotness Azul: Stained Glass of Sintra, sequel to the 2017 hit Azul. In short, "the same, but more"; you have the same mechanism of taking all of a single colour of tile off a circle or from the discard pile, but you have much more complicated rules on where you can place it and how you score when you do so. I've quite enjoyed Azul when I've played it, for all I prefer Sagrada, but this seemed to be trying too hard to be "grown-up Azul". 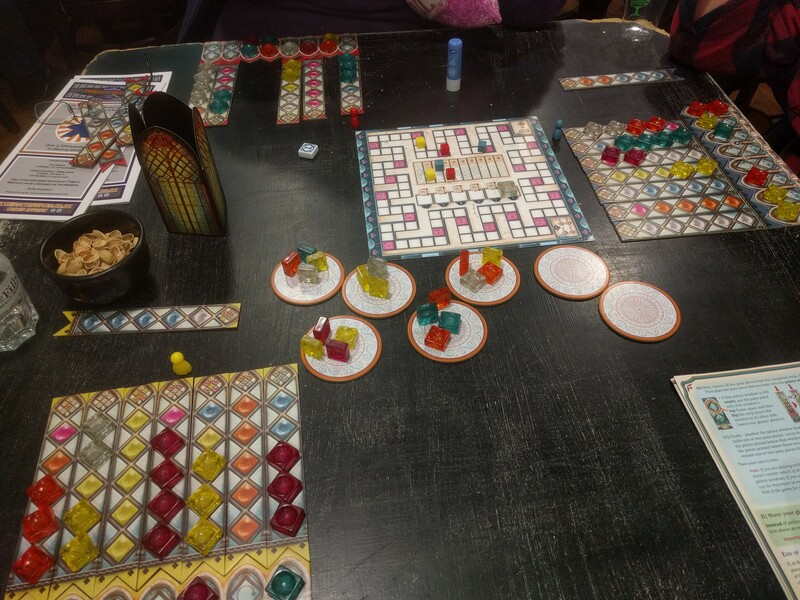 So this ended up being an evening of games we didn't enjoy much. But the company was good and I save money compared with buying them before playing. [Buy War Chest at Amazon] [Buy The Doom That Came To Atlantic City at Amazon] [Buy Azul: Stained Glass of Sintra at Amazon] and help support the blog.